The global competition in all streams of industrial growth is attributed to research & new technological developments. This has necessitated that the engineering and management fields are managed by skilled professionals. Keeping pace with the needs of the corporate world Bhai Gurdas Technical Education Trust, named after the great scholar & poet Bhai Gurdas Ji, was established under the guidance of S. Hakam Singh Jawandha, a man of great vision and dynamism. The governing body of trust includes many educational administrators, educationists, industrialists. Placements : To provide industry relevant directions and guidance to students an effective training and placement cell is involved in arranging pre-placement discussions, on/off campus interviews, project placement and final placement. Cell arranges the industrial visits, summer training, seminars, workshops and guest lectures by eminent academicians, administrators and successful entrepreneurs. Cell helps the students in finding a career that matches students’ skills and interest. Training & Placement Cell was established to have industry- institute interaction and to develop student skills to achieve success in professional career. 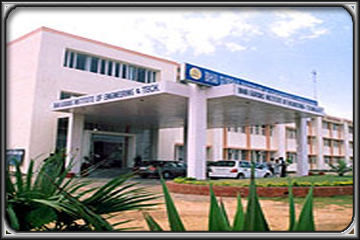 Cell is associated with all engineering departments of the institute. To coordinate the activities of placement cell, a placement committee of students of various disciplines has been constituted. On the placement front the institute has done exceedingly well. Despite the global meltdown, the institute continues to provide 100% placement to all its eligible students. In a span of last two years only, as much as 85 top Indian and Multi-National Companies have visited the campus and 232 students were placed last year taking the total tally to 2800 till date. Central library: Library is the heart of any institution SUKHAM MEMORIAL CENTRAL LIBRARY was founded with the establishment of Bhai Gurdas Institute of Engineering & Technology in the year 2009. The library began its journey with a collection of mere two thousand books of different subjects related to Engineering, Management, along with a few periodicals. Under the guidance of founding Chairman of the BGIET, Sangrur.The library has grown rapidly over the years and is today a treasure house of learning resources. The library is presently housed in a new double storey state of art building. The new building was inaugurated by Honorable Justice M M Kumar. The library has a capacity of 500 users at a time. The library building is divided into several sections spread over a covered area of approx. 33000 sq.ft. The library caters its services to Students, Faculty members, Research Scholars and Staff of the college. The library presently has more than 3500 regular members. The Library is open for 12 hours every day from 8.00 A.M to 8.00 P.M. The Library aims to facilitate its users in their endeavor for study, teaching and research etc., The library ensures collection, prevention and protection of the invaluable treasure of rare Books, Journals, Magazines, Newspapers and Audio videos. The Library is air-conditioned, fully automated and uses Library Management Software. Library has developed a comprehensive collection of information that is useful for teaching and reference purposes The learning resources are upgraded regularly as per requirements and the indent received from users. Even students can place an indent for procuring books which is of interest to them. The Library at present houses more than 45,000 Books, 2000 back volumes of periodicals and journals, 2500 CD-ROMs, Project reports etc. on different disciplines like Computers Science & Technology, various streams of engineering, Business, Management, and its Applied Sciences. Beside the above collection, Library has also a rich collection of books Personality Development and Business promotion etc.. Library is presently subscribing 220 National and International Journals, 15 daily Newspapers. More than 500 International Online Journals in different areas are also subscribed through INDEST-AICTE consortium. Hostel: Ensuring the safety, security, and convenience of the student, BGIET provides boarding with all modern amenities to the boys and girls. Taking into consideration the requirements of the students five hostels namely Kalpana, Newton, Galileo, Kelvin, Einstein and Raman are established. Common room facilities with Indoor games like table Tennis, Chess, Carom etc. and Television set with cable connection. Well equipped modern mess facility to provide nourishing and quality food to the resident boys and girls separately. The hostel rooms are fully furnished with bed, study table, chairs and fans etc. The entire campus is quite safe and secure. Entry to the campus is controlled by security staff at security gate itself. 1 No out side persons will be allowed to stay in the Hostel. 2 Students should bring their own bed, pillow & bed sheets. 3 Students should themselves clean their beds & wash by themselves. 4 The students themselves should replace room bulbs. 5 Hostel premises & the surrounding area should be kept clean & the student should maintain dignity in the premises as well as with the surrounding citizens. 6 Playing cards, drinking or other illegal activity is forbidden in the Hostel, if any body found indulging the above activities will be dismissed/ debarred from the Hostel. 7 Management is not responsible in case of personal involvement in illegal activities. Such students will be debarred from the Hostel immediately without prior notice. 8 Students who would like to travel to their native places have to take permission from the Principal / Warden with a request letter from the parents & they should register their names with the Warden while going to their native places. This is mandatory. Students who are violating the same will be debarred from the Hostel. most fast growth clg in punjab…4th ranked clg in punjab according to placement….